As the weather improves, now is the time to wash away the remnants of winter and take care of some vehicle maintenance. In many parts of the country, plenty of salt, sand or gravel covers roadways during the colder months, none of which are particularly friendly to cars and trucks over the long haul. Both the paint and the underside and often emerge from winter with plenty of residue. A thorough washing that includes the undercarriage will help you avoid the corrosive effects of salt and the abrasive impacts of sand and gravel, and help your ride last for many years. No matter how careful you might be, salt also makes its way into your vehicle, leaving unsightly stains on carpets and upholstery. It’s worth a visit to a detailing shop for a thorough cleaning that can leave it looking like new. Sand, salt and road grit often end up on your windshield, too, where they can tear up the rubber of your wiper blades. If your wipers do little more than streak as spring rains arrive, it’s a great time for a fresh set of blades, so you can see where you’re going no matter what the conditions. Even high-quality wiper blades are comparatively inexpensive and take only minutes to install. Salt- and sand-infused road spray gets sucked into the engine’s air intake as you drive. Fortunately, the air filter prevents this stuff from getting into the engine itself, but in the process the filter gets encrusted in salt, restricting air flow and reducing performance and mileage. Spring is an ideal time to check the air filter and put in a clean replacement so your engine can breathe easier. Winter takes a toll on roads as well as vehicles. As water seeps into cracks in the pavement, it freezes and expands causing chunks of road to pop out. Potholes can catch even the most careful drivers by surprise. Hitting a substantial divot in the pavement, or just sliding into a curb on a slippery road, can leave wheels pointing in odd directions. If your vehicle doesn’t roll straight down the road, the steering wheel pulls to one side, you experience vibration at speed or your tires start to wear unevenly, a trip to the alignment rack will get you back on the straight and narrow, and it costs a lot less than a new set of tires. If you haven’t used your air conditioning system in several months, take the time now to make sure that it will work when you need it. Worn compressor drive belts should be replaced and, if necessary, the compressor itself should be repaired and the refrigerant recharged. Any vehicle system that isn’t operating efficiently can create an additional drain on the engine and cause it to use more gasoline, something no one wants. When you have the air conditioning system inspected, it’s also a good time to have the cooling system checked to make sure the engine doesn’t overheat when you hit the road for spring break or summer road trips. The hoses should be checked for bulges and leaks, and the coolant should be flushed and replaced according to the recommended service schedule in the owner’s manual. Last, but certainly not least, remember to have the oil and filter changed according to your manufacturer’s recommendations. Clean oil will keep engine friction to a minimum, help reduce fuel consumption and extend the life of your engine. Your car, truck or SUV is a big financial investment; spend the necessary time now to keep it running properly and safely for the long run. Worthington, 03/25/2013 – Jack Maxton Chevrolet is partnering with the Olentangy Braves Little Leaguein Worthington. 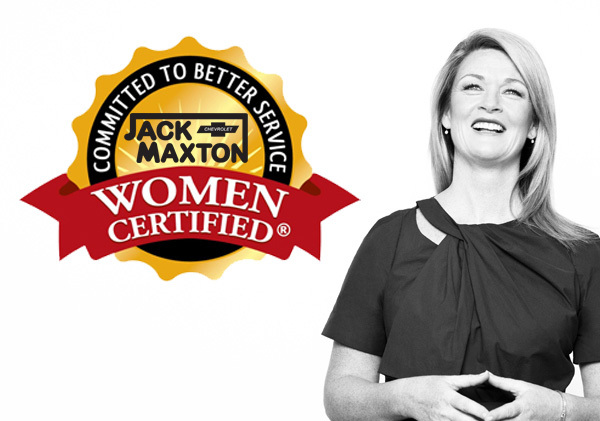 Jack Maxton Chevrolet has joined forces with the national Chevrolet Youth Baseball program to provide new equipment, a monetary contribution, invitations to FREE instructional clinics, and an opportunity for community members to enter the Free Chevrolet vehicle sweepstakes. “Youth baseball provides positive and productive life lessons for young people across America, and the Chevrolet Youth Baseball program is an extension of Chevrolet’s commitment to baseball, community and families. Jack Maxton Chevrolet is bringing that same dedication to youth baseball,” said Jeff Mauk. “There is nothing more American than Chevrolet and baseball and Jack Maxton Chevrolet wants to combine America’s favorite brand and favorite pastime together for our families in Worthington to enjoy,” added Mauk. 2013 marks Chevrolet’s Youth Baseball program’s eighth year, and since its introduction has helped aid local teams, affecting more than 3 million young people in communities where Chevrolet’s customers live, work and play. In 2012, about 1,600 Chevrolet dealers participated across the country. 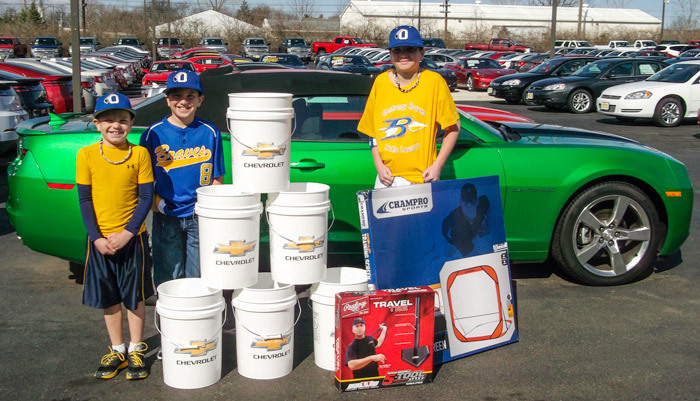 Jack Maxton Chevrolet presented the Olentangy Braves Little League with equipment kits with items including things like equipment bags, baseball buckets, practice hitting nets, umpire ball bags, batting tees and Chevrolet Youth Baseball T-shirts. The sponsorship also includes youth clinics featuring current and former MLB/MiLB players and coaches and instructors from Ripken Baseball. In addition, Jack Maxton Chevrolet will present a check representing a one-time monetary contribution to Olentangy Braves Little League. Sponsored leagues across the country will each receive 2,000 Free Sweepstakes Entry forms to distribute within the community. At the end of the entry period, five winners – one from each region – will win their choice between a 2013 Chevrolet Malibu or Chevrolet Traverse. Each participating market will award a secondary prize. “Chevrolet vehicles are designed and built for families, so we hope young people and their parents will consider a Chevrolet as an official vehicle of their household,” said Mauk. Spring has sprung in Ohio. It’s time to put the snow boots away and take advantage of sunny days and warmer weather. The Midwest has much to offer outdoor enthusiasts, and Ohio is no exception. Get a glimpse of southern Ohio from above the trees. Ozone Adventures is a part of YMCA Camp Kern in Oregonia and offers some of the best views of southwestern Ohio. Sign up for a short tour or consider the five-hour ride that zips its way through 11 zip lines and nine sky bridges. A night tour is offered twice a month for those brave enough to zip the forest in the dark. All participants must be at least 10 years old and 80 pounds. Located in Oregonia, Ozone is open seven days a week and year-round. Visit http://www.campkern.org/ozone for more information. If you have conquered zip lining and seek even more adventure, consider sky diving. Skydive Ohio, located in Xenia, is a favorite among locals for its well-orchestrated skydiving adventures. First-time jumpers and licensed sky divers are welcome, with tandem and single-diver courses. Not sure what to do? No problem. Trained instructors will help lead you through the process. Visit http://www.skydiveohio.com for more information or to schedule your next jump. Have a teen just bumming around the house? Take him or her to BMX Bike camp at Ohio Dreams Action Sports Camp. Located in Butler, BMX camps offer both freestyle and racing opportunities. When you get bored of biking, consider the skateboarding, skiing and scootering programs available for all ages at the camp year-round. Brave enough to attempt a turn? Adult camps and open course times are also available. Visit http://www.ohiodreams.com, or call (800) 963-3495 for a brochure. Although Ohio may not be known for mountainous terrain, it is still possible to scale some slopes in Ohio. Vertical Adventures, located in Columbus, offers indoor rock climbing for beginner to advanced climbers. Once you master the sport inside, challenge your skills outside and consider climbing the Whipps Ledges at Hinckley Reservation Metropark (a permit is required through Cleveland Metroparks, but it is free to qualified climbers). 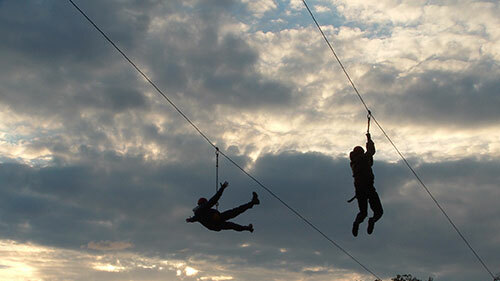 Contact http://www.verticaladventuresohio.com or http://www.clevelandmetroparks.com for additional information. Marmon Valley Farms in Logan County offers the opportunity of horseback riding to riders of all ages. The rustic farm provides the perfect scenery for the long trail rides available at the farm. Located in Zanesfield, the Farm’s riding stable is open all year (reservations are recommended). When you finish your ride, visit the animal barn, take a swing on the playground, or enjoy a picnic at one of the many shelter houses. Visit http://www.marmonvalley.com for more information. If you have cabin fever from being stuck indoors through Ohio’s blustery winter weather, head outside to take advantage of spring with a few outdoor adventures in the Buckeye State. The General Motors Brownstown Battery Assembly plant, in Michigan, is one of the newest and most technologically advanced facilities in the industry. For the first time in recent memory, 45 percent of the hourly workers at the plant are between 24 and 31 years old, part of the “Millennial” generation, also known as “Generation Y,” and they are successfully building the state-of-the-art batteries for extended-range electric vehicles like the Chevy Volt, Opel Ampera and the Cadillac ELR. Millennials, generally acknowledged to be those born from the early 1980’s through around 2004, are known for a multi-tasking and tech-savvy skill set necessary for a job market that rewards diversity and flexibility. Brownstown Battery Assembly is well-suited to the forward thinking, environmentally friendly ideology that characterizes Generation Y. “As the only U.S. facility that mass produces batteries for extended-range electric vehicles, Brownstown Battery Assembly, part of a wholly owned GM subsidiary called GM Subsystems Manufacturing LLC, provides new and different jobs that pique the interest of younger job seekers,” stated a GM press release. This GM company is providing Millennials with much-needed opportunities for growth, and not only are these jobs benefitting and increasing the job security of a generation, the generation is also helping the auto industry. Jay, Baron, president and CEO of the Center for Automotive Research, maintains that enticing and recruiting young workers, a task that hasn’t been easy, is necessary for the health and future of the auto industry. GM and the Millennial generation are working together to move forward in a productive direction that is mutually beneficial, a great sign for the future of the auto industry and the country’s young workforce. The Chevrolet Corvette has always supplied more performance per dollar than any other car in its segment. With the January introduction of the 2014 Corvette Stingray at the North American International Auto Show in Detroit, Chevrolet has pushed sports car value farther than any other brand in the world. The new Corvette will be available here at Jack Maxton Chevrolet in Worthington, Ohio in the coming months. The 2014 Corvette Stingray, the first Corvette to wear the “Stingray” badge since 1976, is almost entirely new from the ground up, sharing only two parts with the previous-generation Corvette. The new Stingray has an all-new frame––manufactured in-house for the first time, in a new, $52 million body shop at GM’s Bowling Green, Kentucky, assembly plant––new chassis, new powertrain and completely new interior and exterior designs. The 2014 Corvette Stingray also features a lightweight, carbon fiber structure for the hood and removable roof panel, and composite fenders, doors and rear quarter panels. This new, seventh-generation Corvette is the most powerful standard Corvette in history. At its heart is an all-new 6.2-liter LT1 V8 that combines direct injection, Active Fuel Management, Continuously Variable Valve Timing and an advanced combustion system for an unparalleled balance of power and efficiency. The numbers of the Corvette Stingray are simply amazing: 450 horsepower and 450 lb/ft of torque, a blistering, zero-to-60 mph acceleration time of less than four seconds and fuel efficiency expected to exceed the current model’s already impressive 26 mpg highway, which will make it the most efficient Corvette ever. With a new aluminum frame that is 99 pounds lighter yet 57 percent stiffer than the previous steel frame, the 2014 Corvette Stingray has a better power-to-weight ratio than both the Porsche 911 Carrera and Audi R8. More than six million hours of analysis went into the combustion system, which features a 13 percent improvement in airflow thanks to a larger, 2.75 inch diameter exhaust system. An available dual-mode active exhaust system offers a 27 percent improvement, with two additional butterfly valves that open to increase engine performance and a more powerful exhaust note. Part of what gives the Corvette Stingray such impressive power and efficiency numbers is the choice between a six-speed paddle-shift automatic transmission and an industry-exclusive TREMEC seven-speed manual with Active Rev Matching. This revolutionary transmission and driver-selectable rev-matching system on up-shifts and downshifts uses close ratio gearing, a dual-mass flywheel and dual-disc clutch for seamless shifts. The Corvette Stingray boasts a perfectly balanced 50/50 weight distribution for tenacious amounts of cornering grip, in excess of 1g. A track-specific Z51 Performance Package includes an electronic limited-slip differential, dry-sump oiling system, differential and transmission cooling and an aerodynamics package for increased stability at warp speeds. The Corvette Stingray is a no-compromises track beast, but it also has the manners to be a pleasant daily driver. According to Chevrolet Product Manager Harlan Charles, “The all-new Corvette Stingray is really three cars in one: It provides the comfort and functionality of a long-distance GT car, the connectedness and infotainment of a daily driver and the acceleration, grip and braking of a capable track car.” A third-generation Magnetic Ride Control system delivers greater comfort and control in everyday driving, as does an all-new electronic power steering system that is five times stiffer than the previous generation Corvette. Standard on every Corvette Stingray are four-piston, race-engineered Brembo brakes, for a nine percent improvement in stopping distance over the previous-generation Corvette. 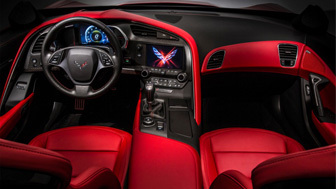 In addition to its handcrafted, premium interior, perhaps one of the most significant aspects of the 2014 Corvette Stingray is its completely new appearance, which is nothing short of stunning. Featuring an irresistible blend of classic styling cues from the original 1963 Corvette Stingray and futuristic, supercar touches, the 2014 Corvette Stingray exterior appearance is as serious and performance-oriented as its powertrain. Every square inch of the 2014 Corvette Stingray was designed with aerodynamics and component cooling in mind. Special brake-cooling ducts, air deflectors, rear spoiler and hood vents are all drag-reducing touches integrated from the Corvette Racing program – the most successful program in the history of the American Le Mans Series. One of the most dramatic visual elements of the Corvette Stingray is found out back – three-dimensional LED lamps that cast light upward from the bottom of the housing for a glowing appearance unlike that of any other vehicle. Inside is a fighter-jet-inspired cockpit blending soft-touch materials, premium carbon fiber, aluminum and available Nappa leather with advanced technology like dual high-resolution information screens and a color heads-up display. Two types of more supportive, well-bolstered seats are available, made with lightweight and stiff magnesium for optimal all-around comfort or high-performance driving support. The new, cockpit-mounted Driver Mode Selector controls 12 vehicle systems and gives drivers five settings to choose from, depending on driving conditions: “Weather,” “Eco,” “Tour,” “Sport” and “Track.” The Driver Mode Selector changes the dynamics of the Corvette Stingray vastly, making it an exceptionally versatile vehicle that’s comfortable in nearly all conditions and settings. The 2014 Corvette Stingray represents not only one of the greatest sports car values in the world, but one of the greatest in history. No other vehicle gets it so right on so many different fronts – daily driving comfort, blistering track performance, head-turning style and superior fuel economy. The 2014 Corvette Stingray represents a new era in sports car value. Stop in today and you can be among the first to drive this much anticipated marvel of American engineering and technology.